Hooray, it’s International Red Panda Day! On Saturday, September 16th the Red Panda Network and many zoos all over the world want to raise awareness for this species and the conservation work in the habitat of the Red Panda. There are a lot of events on this day. Here are some of our favorites. PS: #IRPD2017 is the official hashtag. One of the most tasty events on Red Panda Day is called “Pancakes with Pandas”. Enjoy your breakfast while you can watch the Red Pandas Slash and Amaya. The Pueblo Zoo offers some artsy Red Panda Day activies from 9 AM to 1 PM – like drawing a Red Panda behind-the-scenes. Entries for that can be purchased ($5) until 12:30 PM. At 11 AM there will be a special Red Panda Keeper Talk. Binghamton Zoo at Ross Park celebrates International Red Panda Day from 10 AM to 4 PM. Listen to two special Keeper Talks at 11 AM and 1:30 PM and get some updates about Red Panda cub Rowan. From 10 AM to 3 PM Franklin Park Zoo is also celebrating International Red Panda Day. Visit the brandnew Red Panda exhibit within the also new Children’s Zoo. At 11:30 AM and 1:30 PM the keepers will be there to talk about the Red Pandas. So many things to do at Roosevelt Park Zoo! At 10 AM the Ranger Station opens, where you can complete your first level to becoming a Red Panda Ranger. You can also create your own Red Panda button for $3 – all proceeds will be donated to the Red Panda Network. Keeper Talk is at 11 AM. At 2 PM you can observe a Red Panda Training Session with Red Pandas Fred and George. Lee Richardson Zoo celebrates International Red Panda Day from 1 PM to 3 PM outside the “Wild Asia” area of the zoo. You can pick a passport to travel to the habitats of the Red Pandas and to collect stamps by completing a challenge. There will be also a Keeper Chat at 1.30 PM at the Red Panda exhibit. Gray Fossil Site invites you to Red Panda weeks. Until October 1 2017 you can learn more about Red Pandas of the past and today. Programs will be announced periodically throughout each day. Tasmania Zoo has some interesting events on the weekend before International Red Panda Day. Special Guest will be Emma Dale of the Red Panda Trust. She will talk about her visit to Nepal and her research. And you can take part at the Red Panda face painting and grab some Red Panda cupcakes – kids eat free! Wellington Zoo celebrates a “Red Panda Weekend” and calls the visitors to wear red on these days. Red Panda Ranger Talks are at 1:30 PM and 4 PM, from 1:30 PM to 1:40 PM you can help to build a bamboo tower for the Red Pandas. On Sunday from 12 to 1 PM there is a workshop with Wellington Zoo’s Community Partner workerBE oasis where you can make a bamboo plant holder. Longleat Safari Park has started a competition on Facebook, where you could win a Red Panda VIP experience for two on International Red Panda Day, Saturday September 16. The competition closes at midday on September 8 2017. 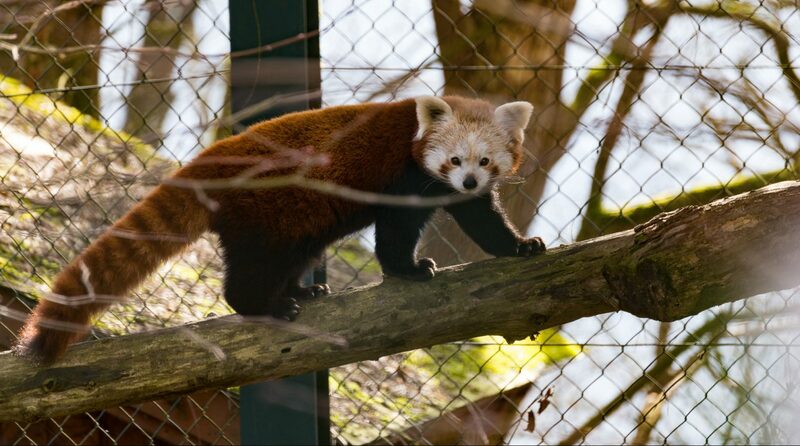 From 11 AM to 3 PM there is a variety of Red Panda fun and activities at Highland Wildlife Park. Take part at the Red Panda quiz and you have the chance to win a great price for a Red Panda fan: feed a Red Panda. Parc Animalier de Sainte Croix celebrates Red Panda Day with presentations about the conservation actions of the Red Panda Network and CPPR (Connaître et Protéger le Panda Roux). Plus: Origami and games. Le Parc de Clères also works together with CPPR (Connaître et Protéger le Panda Roux) to make International Red Panda Day a special day for all “Panda Roux” fans in France. Visit Packa and Poya, the two male Red Pandas of the zoo. The Parco Natura Viva in Italy is situated near Lago di Garda in Northern Italy and offers special activities like bodypainting or presentations. At 7.30 pm there will be an Asian buffet at the “Simba” restaurant of the zoo. Parco Faunistico “Le Cornelle” is also in Northern Italy, next to Milano. At 11 AM and 4 PM the Red Pandas get tasty bamboo. You can find Red Panda events in Germany and Austria on the German edition of Red Pandazine! “The Firefox Guardian” is a new documentary film about Red Panda Network’s Forest Guardians in Nepal directed by filmmaker Gunjar Menon. On International Red Panda Day you can watch the trailer for this film for the first time. Watch Fort Wayne Children’s Zoo and their Red Pandas Xiao and Mars live on Facebook. And yes, there is a Red Panda cocktail if you want to party on International Red Panda Day! @RedPandaMasala the Red Panda cocktail is a spicy blend of gin, tomato, sriracha, kaffir lime leaf, worcester sauce and guinness!